In this guide we're going to cover the process of creating a custom Dradis template to display data imported from Nessus. The same concepts apply to any of the other plugins. 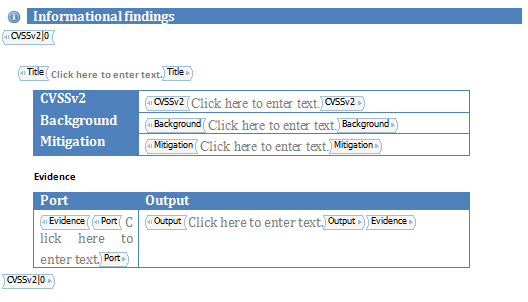 You will also learn how to filter and sort the findings in the report by CVSSv2 ranges. Download the resources including a sample Nessus file and the finished report template used in this guide from the Users Portal. Why are only 4 issues exported? 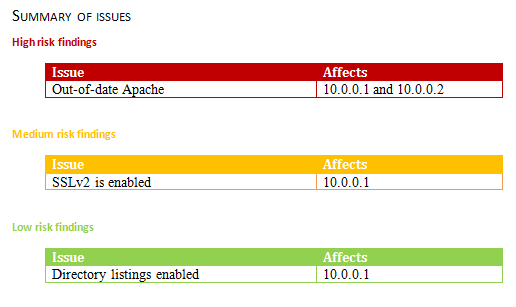 First, a summary section where the issues affecting each host are listed sorted by severity. Second, the same list of hosts but this time each issue will be described in full detail. Finally, a section that lists all the issues in the environment along with all the hosts affected by them. Now that you understand the Plugin Manager basics, it's time to configure your Plugin Manager to match this custom report template. 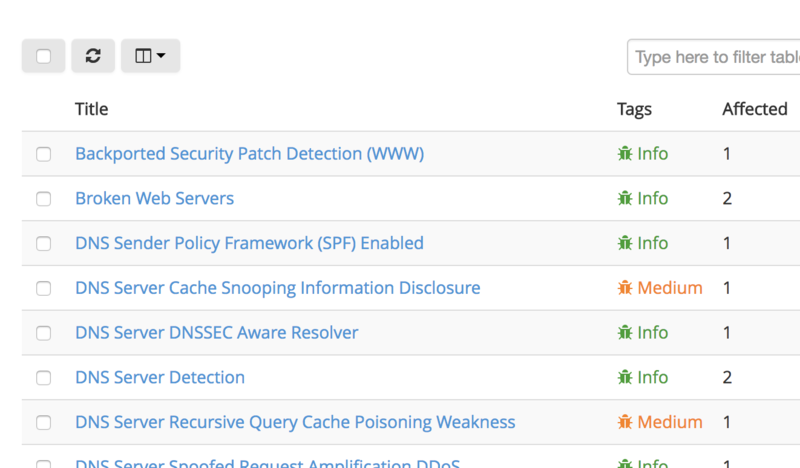 Select Dradis::Plugins::Nessus in the left sidebar. Click Save Template. 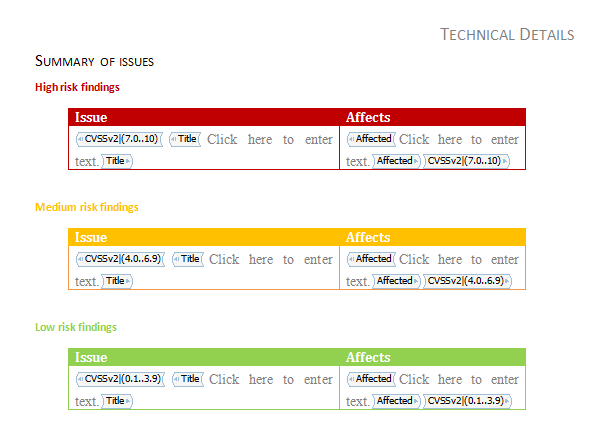 Then, use the green Change Template button and select the Report item template. Click Save Template. Then, navigate to Projects in the header and create a new blank project. 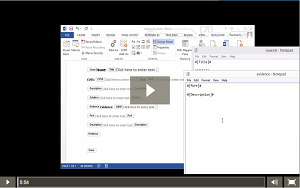 Open the project and navigate to Upload output from tool in the header. Under Choose a file, select a Nessus file from your local system. Navigate to All Issues and check out the Issues that have been added to your project! Confirm that the Issues that have been added to the report in exactly the structure we need for this custom report template. It's time to fire up Word and create our report template. Conceptually, what we're trying to do in this section is easy: list all the hosts and for each of them create display the list of issues that affect it ordered by severity. 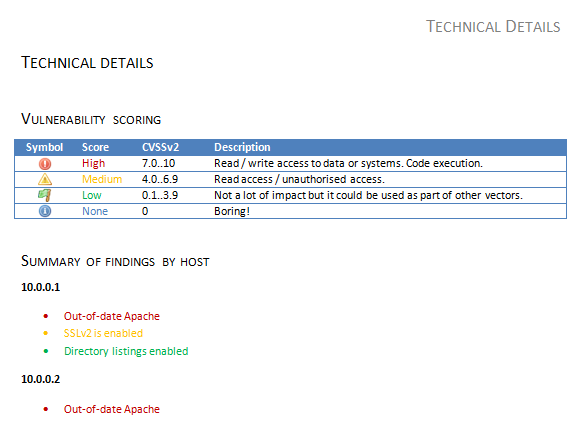 To accomplish this, we are going to need a Node content control (to cycle through all the hosts) and inside it, 4 Issue content controls (one for each risk rating) with the corresponding CVSSv2 filters. In this case we are listing all the hosts again, but we want to provide full details about each of the issues including the background, solution and plugin output. There is nothing special about this section. If you need more information about reporting by Node, or displaying the Evidence associated with a given instance please revisit the earlier pages of this guide. This one is another simple section but it is interesting as it provides the information the other way around. Instead of going from each host and displaying all the issues that affect it, we will cycle through the issues and display all the hosts affected by them. The Title field of the issue. 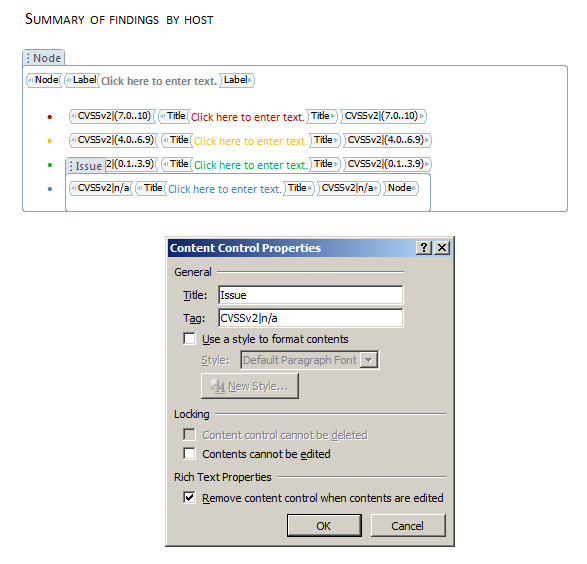 The Affected content control. Remember that special content control? It outputs a comma-separated list of all the Nodes affected by an Issue (the Nodes that have a piece of Evidence linking them to the Issue). The enclosing Issue tag with the corresponding CVSSv2 filter. This is the expected result, and it has to do with the way in which we have defined our issue filters. If you remember we defined our informational findings as those having a CVSSv2 score of 0 (e.g. we filtered the Issue controls by CVSSv2|0). This example rule is an overachiever and tags the incoming Issue at the same time! If do decide to use a Change Field Value Rule, make sure that you re-upload your Nessus file to a new project so that the Rule can apply! Plugin Manager or Rules Engine changes do not impact already-existing projects. 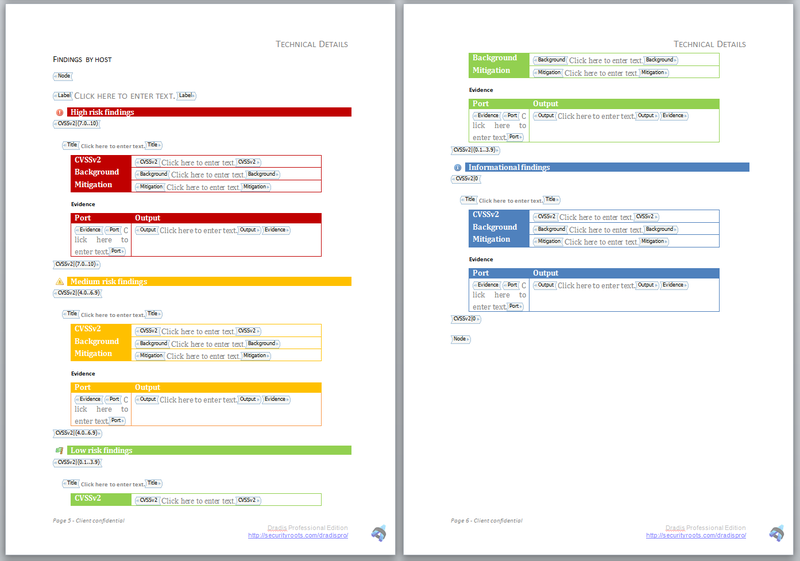 Before you go, From Nessus to Word video for a visual walk-through of this process from another perspective and using a different report template. Great job, you reached the end of the guide! Have you read all of them?